Two of the most exciting names in the classic car hobby have once again teamed up to bring one great event to the All GM Nationals. Carlisle Productions and the Mid Atlantic Impala Association present the 4th Annual Full Size Chevy Nationals at the Carlisle Fairgrounds, in Carlisle, PA.
June 23-25, 2006 in conjunction with the All GM Nationals. This event is FREE* to all owners of 1958-1990 full size Chevrolet automobiles only after paying the registration fees for the All GM Nationals. Cost and further information about the all GM Nationals can be found on the Carlisle Events website. For more information continue browsing this page or visit the official Carlisle website, if you have questions please contact us at one of the numbers or addresses below. 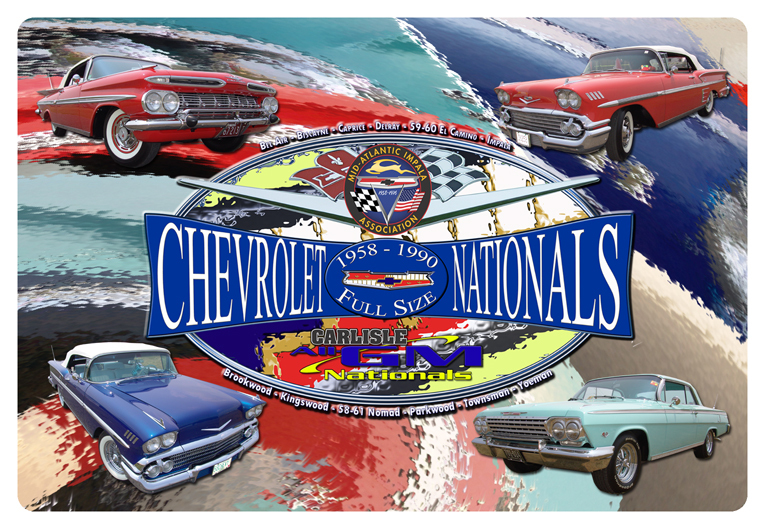 Registration for Full Size Chevy Nationals has begun! Online registration available. Click register! 1. Addition of New Format, New Score Sheet Grand National Competition includes entry into the Old Car Championship Series. 3. Full Size Nationals Class Judgingis still Free with Carlisle admission but is now separated from Grand National Competition. The 2006 FSCN will feature expanded classes to include 1977-1990 Full Size Chevrolets. Judging Sheets and Rules and Regulations released for Full Size Chevy Nationals. Check out the Latest News Page for all the details.